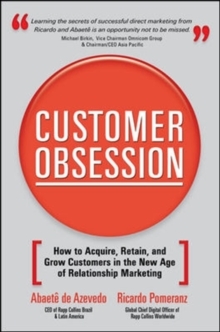 Customer Obsession is an invaluable hands-on guide to the next generation of customer relationship marketing. Abaete de Azevedo and Ricardo Pomeranz, top leaders at the world-renowned direct marketing agency Rapp Collins, reveal how businesses of any size can develop a global strategy that embraces today's empowered consumers and encourages the development of meaningful, profitable relationships with them. Sharing insider details from Rapp Collins's breakthrough methodology, the authors provide the tools to implement the next level of relationship marketing, enabling you to pinpoint the unique value of every customer and specific direct marketing techniques for winning them over. You get practical steps for integrating your brand communications and identifying a strong marketing concept to create a campaign that establishes personalized connections with consumers. Then, you'll learn how to:Implement your relationship marketing program in four phases: strategic analysis, planning, implementation, and controlUtilize databases to gather individualized information and create targeted messagesCreate specific campaigns that are relevant to different segments of consumersMeasure marketing campaign results with ROI calculation modelsDevelop practices that will continuously improve ROIRounding out this invaluable guide are illuminating case studies of numerous national and international brands that successfully used relationship marketing to meet their communication needs. 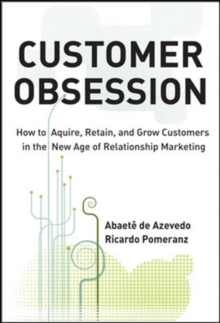 Customer Obsession is the definitive roadmap for all businesses that want to achieve the maximum return for their marketing investments.